Birds are chirping, the sun is shining and now is the right time to start your cycling adventure. If you have always wanted to cycle through the city but procrastination has had the better of you, monsoon is the best time to get with it. Pedal on peeps with amazing trails around the city. With a chance to discover some of the most prominent landmarks of your city in their most serene moments, South Mumbai is best experienced during the early morning hours. Some of the sights include the heritage buildings around the Fort, the stunningly beautiful waterfront promenade stretching till the National Centre for the Performing Arts (NCPA), and of course, the Iconic Gateway of India. Plus, with quite a few eateries on the way, you can end your trip with a well-deserved breakfast. You can check for the monsoon midnight rides that keep happening regularly too. An untouched coastal space in the heart of Mumbai, Uttan is perfect for those who want to cycle around some unexplored gems in the city. With its beautiful beach, monsoon is a great time to go here and enjoy some time to read, listen to music, or even pick up an easel and paint. Also, don’t miss the opportunity to trek to Dongri Hill, which is a great location to cycle, along with an opportunity to enjoy some scenic views as well. Plus, with some incredible food, monuments and quaint homes, this trip is sure to refresh both your mind and body. Located near Malad, this is a Mecca for all cycling enthusiasts. It is a perfect piece of a beachside city, with beautiful vistas of fishing villages and mangroves. Add to that, it’s ancient churches and cottages only make it even more charming. Since this is quite a long journey, we recommend you do not leave home without a few requisites like sunscreen, rain shield and water to keep yourself hydrated. Located on NH8 highway, Vandri is a good alternative for some who are looking to escape the chaos of the city. The best part about planning a trip here is that there are a host of places that you can explore including the Kamandurg Fort, Pelhar Lake, Takmak Fort, Vandri Lake and Tandulwadi Fort. There is also a small village nearby, where you can interact with the locals. Weekend plans sorted, right? Stretching from Goregaon till Powai, Aarey Milk Colony offers many short and diverse trails. If you are looking for some clean air and want a break from your hectic schedule, this trail is sure to become your favourite. A word of advice, since there are quite a few downhill sections here, make sure that you are physically equipped for this journey. Easy single tracks, a fast-flowing trail near the police checkpoint at the Aarey guest resort and a downhill section on the other side of the guest house are just some of the sights that you can enjoy on your trip here. But don't venture out at night here, the place has quite a flourishing wildlife that you should maintain distance from. If you are someone who finds themselves healed and complete in the company of nature, then the clear roads heading to Kanheri caves in Sanjay Gandhi National Park are the best destination. That’s not all. The cycling path is a very well laid-out cemented road, and is covered with thick foliage, making it adept for visitors as well. It takes approximately 60-80 minutes, including stop time, to complete the trail. Also carry a proof of identity, if you are looking to rent a cycle from here itself. 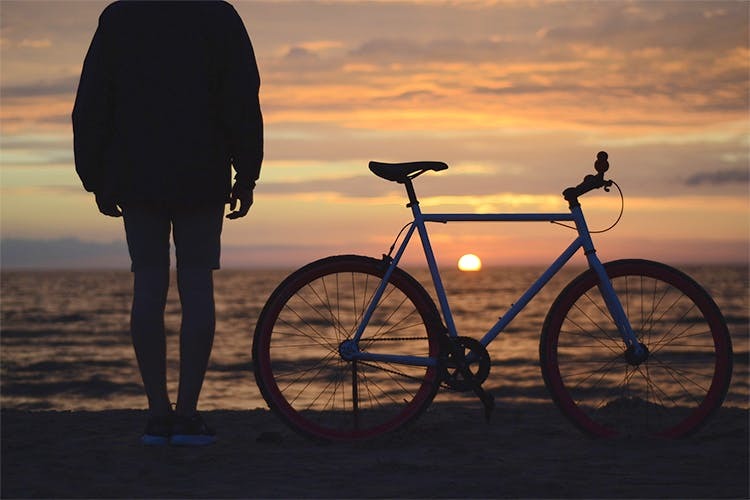 From scenic rides along the beach to secret paths with incredible views, this is your chance to go on some cycling tours that will make your mornings truly memorable.